Most of you don’t know what processes are actually happening inside of you every day. There are microorganisms everywhere and you can’t see them, but they are inhabiting you and everything else. You are 100 trillion cells of bacteria. Do you know how much that is? 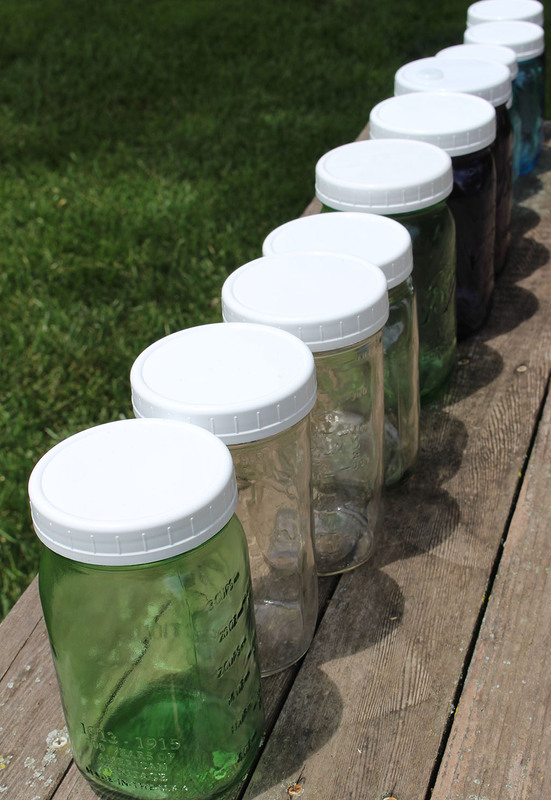 To get a point of reference, you could take canning jars and line them up to span 14,000 miles – that is 1 trillion glass jars. This is roughly the distance from my home (Kansas City) in the middle of America to Beijing, China – and back. Now do that 100 times and you have 100 trillion. This is hard to comprehend, that we are essentially sacks of bacteria. Bacteria outnumber the cells in our body ten to one, and yet it seems the main thing you hear about is how to destroy bacteria. Antibacterial soaps and dispensers are everywhere. Antibiotics are plentiful and used regularly by most people with the thinking that there will be no negative consequences to killing both the good and the bad bacteria inside of them. Don’t get me wrong, there are times when antibiotics are needed and should be used, but this should be infrequent and as little as possible so that we don’t kill the good bacteria that protect us. The more good bacteria you have, the less sickness and disease you will experience. It’s designed this way to help keep you healthy. Although antibiotics can be effective in ridding us of harmful bacteria, if we don’t rebuild the good bacteria that we also kill with the antibiotics, we will find ourselves in a vicious cycle of having to take antibiotics regularly – thus causing more sickness and disease instead of less. Building up the good bacteria will protect us from getting sick, and wellness will be the norm. If we are 100 trillion bacteria and 99% are harmless, or good bacteria, don’t you think we should be paying attention to the things they do? And why not eat foods that make them grow and multiply and become stronger? Probiotic foods just make sense. Build up the bacteria and make it strong and mighty, then you and your 100 trillion bacteria will be a force to be reckoned with. A study called the Belly Button Biodiversity Project at North Carolina State University found about 1,400 different strains of bacteria living in the navels of 95 participants. 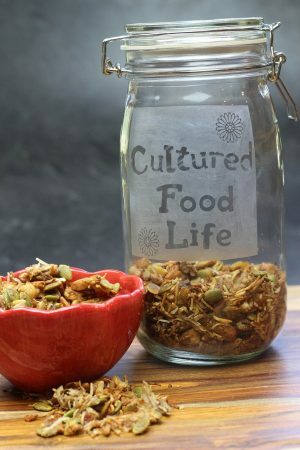 Of these, 662 strains were previously unrecognized.That’s a lot of different strains of bacteria living in and on you, and this is why I recommend eating different types of cultured foods that supply different strains of bacteria. Bacteria are intelligent and have a complex system of chemical “signals” that go both within and among bacteria, helping them decide what to do and how to act. In the April issue of the journal Trends in Microbiology, Klaas J. Hellingwerf found that the bacterial system contains all the important features that make neural networks function, leading to the idea that the bacteria have “a minimal form of intelligence.” For instance, some strains of bacteria commit suicide when infected by a virus, thereby protecting their bacterial neighbors from infection. Bacteria cooperate: they can group together to take on tasks that would be difficult, or impossible, for one to handle alone. A single bacteria can contain dozens of such systems operating at the same time for different purposes. 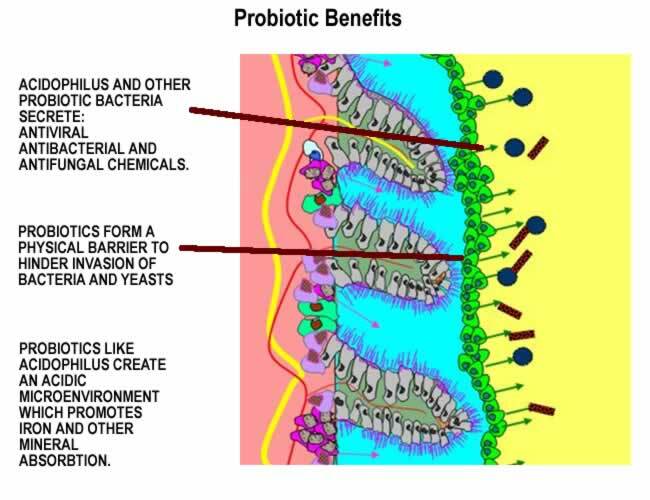 So, why should we eat more probiotic foods, and will it make any difference? You and your bacteria are co creators in this life and should be best friends. We need good bacteria to digest food, to synthesize certain vitamins, and to form a barricade against disease-causing bacteria. But this is just the beginning of understanding what they can do. They are now saying bacteria control our weight and brain chemistry, and the list keeps growing. When I started to consume these foods, I got better. Not just better . . . I went from really sick with diabetes, high blood pressure, and chronic inflammation to feeling like I was aging backward. Everything started working better. My brain was clearer, my emotions were enhanced, my joint pain was gone, allergies got better, serotonin produced feelings of well-being – and sadness and despair . . . gone. Oh, how I love these foods because they brought me here. You don’t have to believe me, just open your mind to the fact that there is something living inside of you by the trillions that is trying to help you. Don’t kill it! Feed it probiotic foods and watch it grow and thrive. Get to know the bacteria inside of you and they will change not only your digestion and stomach problems, but you will see improvement in so many other health issues as well. They will convince you of their power and then you will know for yourself. You’re so much more than flesh and bones. You’re mostly bacteria – the good kind. Get to know your bacteria and become friends. They have always been there, helping you twenty-four hours a day, seven days a week. They don’t get weekends or vacations, they slave away night and day assisting the numerous processes in your body. They can make you well. It’s their job, but they need your help. They’ll be your very best friends. 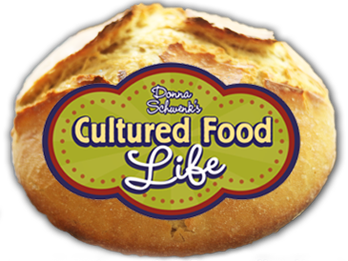 Check out this link to get started with cultured foods. 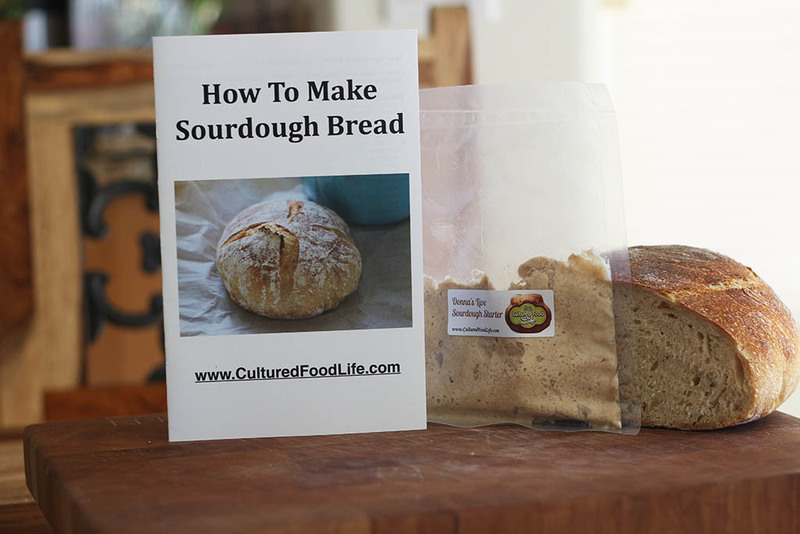 20 Easy Ways to Get Cultured! 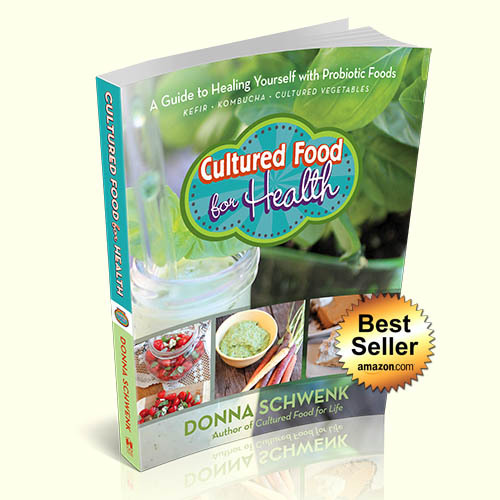 Welcome to the world of good bacteria and probiotic foods. We have been waiting for you . 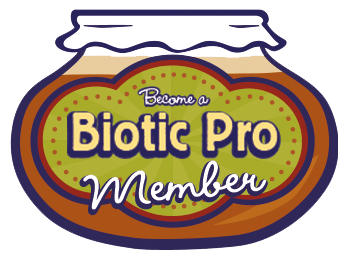 . .
Here’s some new recipes for my Biotic Pro members! 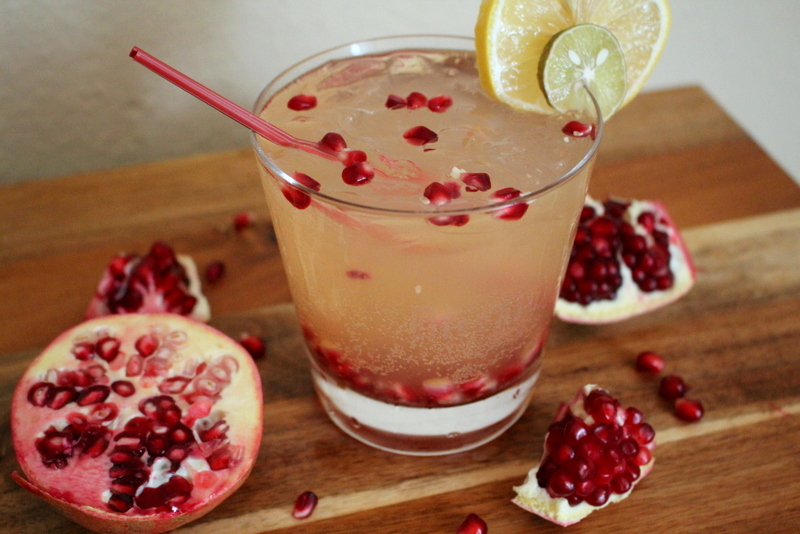 You can make this recipe with Pomegranate juice or pomegranate seeds or both! 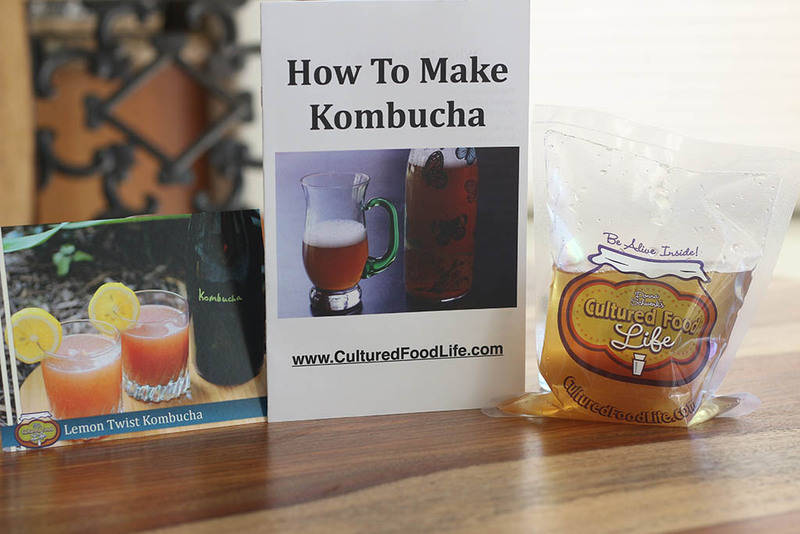 The seeds give the kombucha a delightfully crunchy surprise. If this isn't to your liking replace with 2 ounces of juice. 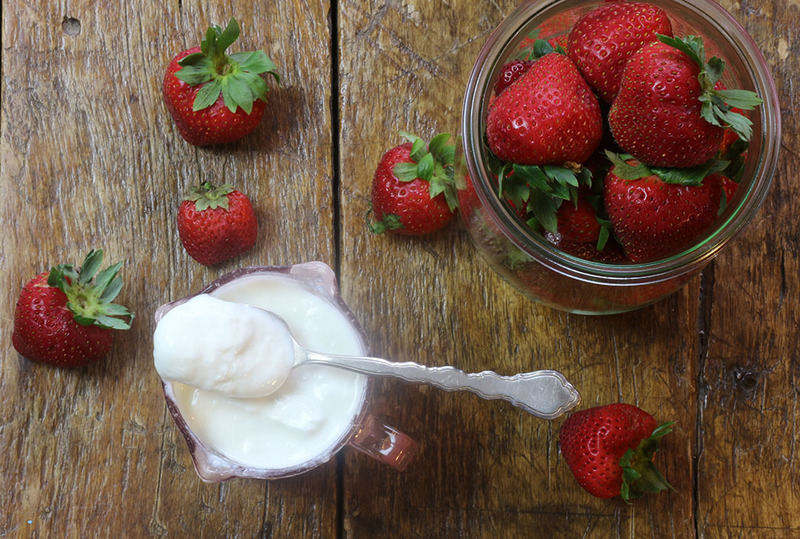 39 Responses to "Will Eating Probiotic Foods Make Any Difference?" Donna your kefir grains are amazing! 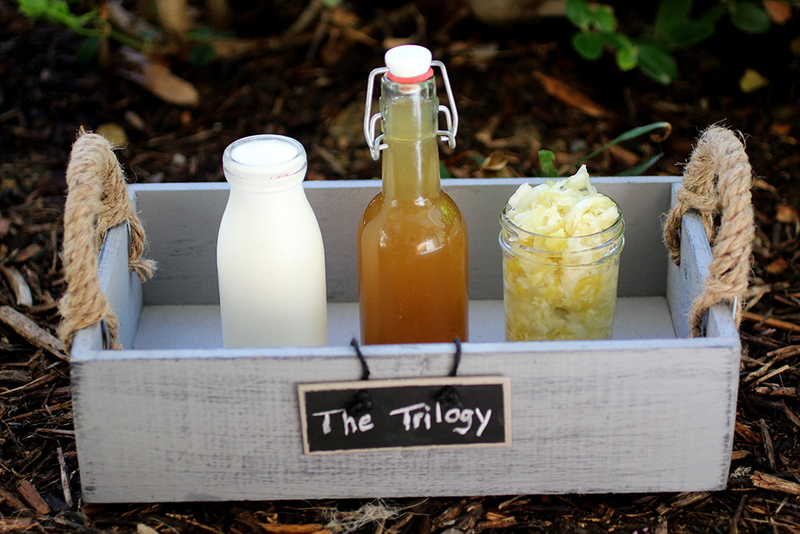 I have a question…do you think that a person needs to kill their bad bacteria first with botanicals or can we crowd them out with home fermented foods like kefir, kombucha and sauerkraut? They say that even botanicals can kill our good bacteria. You can usually crowd them out with probiotics and prebiotic foods however there are some cases where you might need to have a little extra help if your have a large over growth but this is not often the case. Also your correct these can kill both good and bad bacteria. Thats wonderful news Jackie!!!! Thanks for sharing. I too enjoy and gain great wisdom from you and this site. I have both of your books which get my heart rate going because I get so excited, I don’t know which recipe to do… picking is so hard! 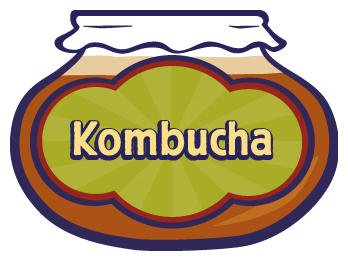 I have making kombucha for about three years now and all of a sudden for the last six monthIs I can not get a scoby to grow! I do both, single batches and continuous batches with the same result…first batch good and a scoby has grown then the follow two batches either have a thin scoby or none and very yeasty tasting like beer. I always brew for 11 to 14 days. I bought a brew belt just in case the temp. was the issue and that has not helped. I am at my wit’s endddd!!! Reply to Jena Glenn–I don’t think you can boil fluoride out of water like you can with chlorine, just filter it with a good water filtering system like Berkey or ProPUR. That may be what’s killing your water kefir grains. Another option is to use spring water. Your proportions sound pretty close–I use 1/4 grains in 4 cups water with 1/4 cup sugar. There is a Facebook group called “I love water kefir” which you can join & I have found good info there from other group members. Hope that helps! I am reading Dr. Bakker book. He recommends all the food that Donna recommends. It is 700 pages. It is a long one to read it, but there are useful information in it. I wish it would be sorter, but you can short out the useful information from it. The best one I have found so far. Of course, he says that his pills are the best, but he also gives you all the other products that help with Candida. 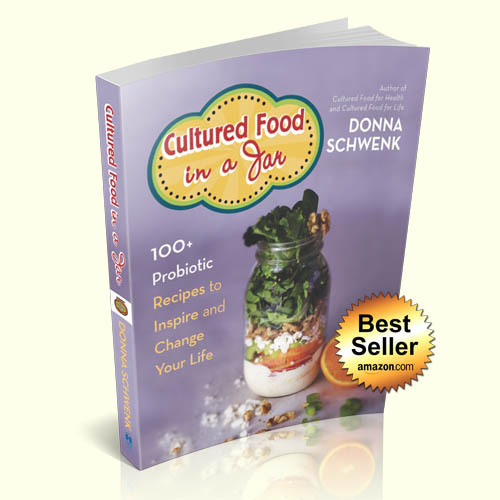 I did have concern about fermented food, but he just confirmed Donna’s advice. Donna, thank you for your help, and good advice. Just a FYI: to remove fluoride from water requires special filtering…..boiling will NOT do it. 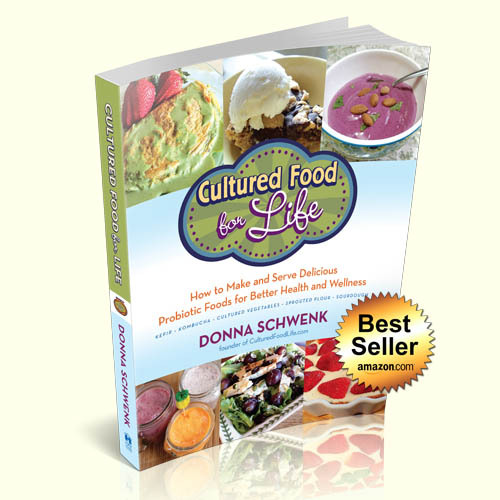 I love Donna and have learned so much about fermented foods. I make her flu vegie recipe and kefir all the time. My husband who has IBS has tried many times but he can’t even have a teaspoon of the vegie juice without having stomach distress. 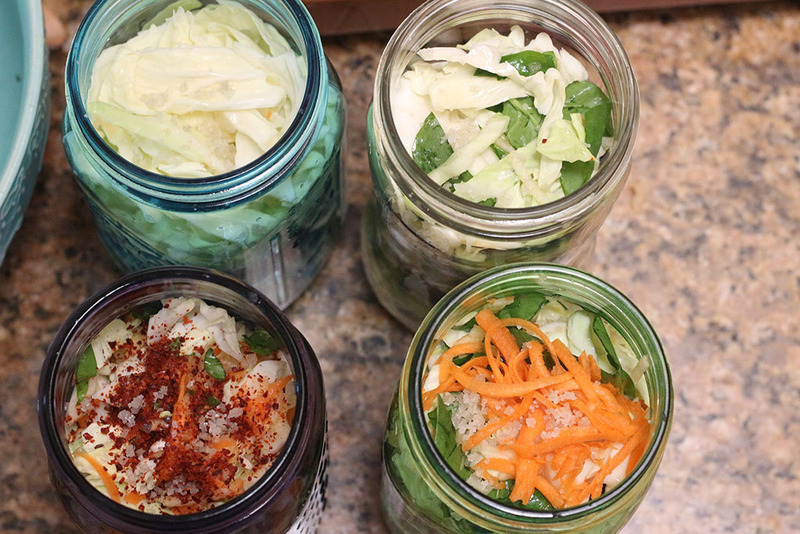 Fermented foods are very high in histamines and according to Dr. Suzy Cohen, people with IBS should probably steer away from them. There can be other health issues stemming from eating diet high in histamines. So as much as I would like to believe they are the answer to all health ills, some people cannot tolerate the histamine level. It’s a wonderful thing to have this on hand. So glad you feel better. I’ve been doing the trilogy for about a year now. Someone sent me an article yesterday by a functional medicine practitioner warning about the histamines in fermented foods saying they were especially bad for people with autoimmune disease like I have. 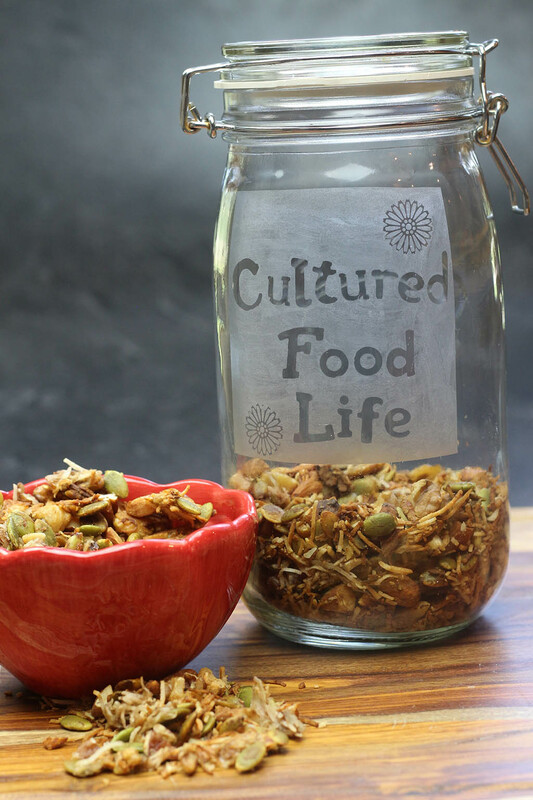 Do you know anything about the levels of histamines in kefir, kombucha and cultured veggies like kraut? I don’t want to give them up! For those of you still having health issues even after eating fermented foods I read an article by Dr. Suzy Cohen explaining that they are not for everyone and can actually hurt some worse (IBS people and more ). It is because of the extremely high histamine levels. 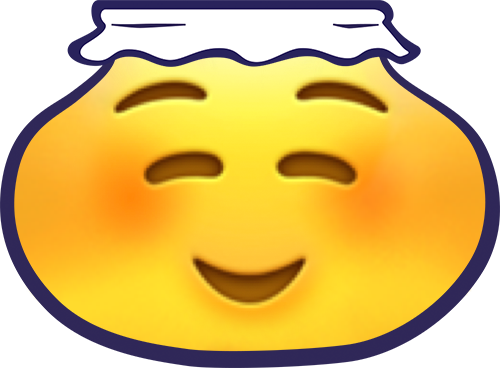 I can eat all kinds of fermented foods and feel great. My husband who has IBS and otherwise is healthy (following healthy diet for decades) can’t even handle ACV or a teaspoon of sauerkraut juice. 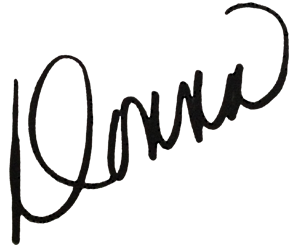 I love Donna and believe she has helped many but there are some whom this isn’t going to help. How long before you started seeing significant benefits to your health when you started this journey? 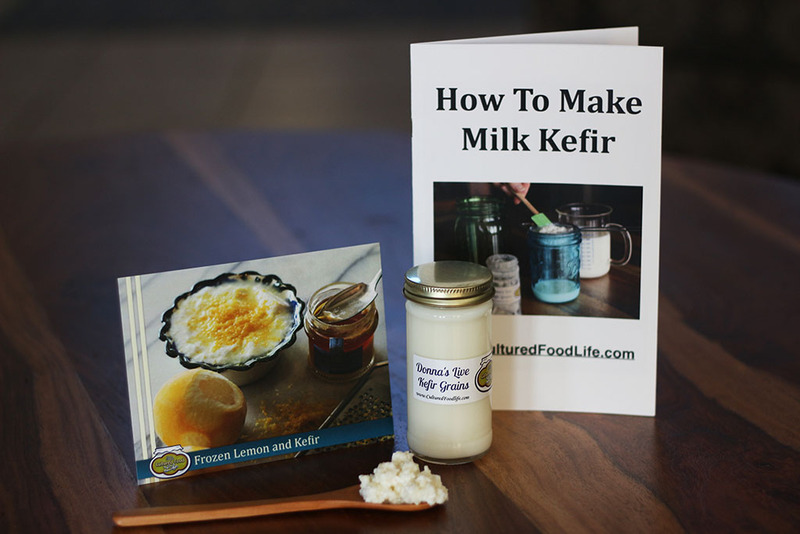 I have been doing raw goat milk kefir, kombucha, and making my own sauerkraut or kimchee for about two years now and I am still struggling with my health issues. I try to avoid all medications, even over the counter, but have had to have a couple of injections of Enbrel for my autoimmune disease. Thank you for sharing your journey and your wisdom! How long did it take for your health to significantly improve? I do raw goat milk clustered milk (darn auto correct won’t let me spell the k word), K tea, and a small amount of cultured sauerkraut daily for almost two years and I do not seem to be making any progress. I am frustrated. For the most part, I try to stay away from any medication, including over the counter but have had to get an occasional injection of Enbrel. Thanks for sharing your journey and your wisdom. It depends on the types of things you are experiencing. Some like myself, in a month, in others a year. It really just depends but you should see improvement. 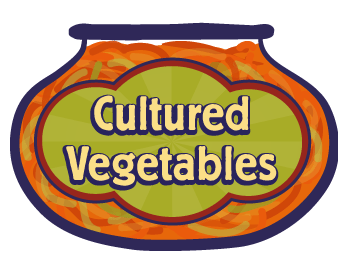 Most will notice a huge difference when they stop cultured foods because their bodies will let them know they need to keep consuming them. Dear Donna, I would like you opinion or experience on this please. And if anybody else wants to share some wisdom. Thank you. No it will still remain in tact in the body. I have been growing water kefir grains, but I am killing them. They are turning to mush. I have been all over the internet trying to figure out what I am doing wrong, but I just can’t figure it out. I use 1/4 cup grains in 4 cups water and feed them 1/3 cup sugar. I boil my water to get rid of the chlorine and fluoride. What am I doing wrong? Are you putting them in water that is hot and how long are you fermenting them? 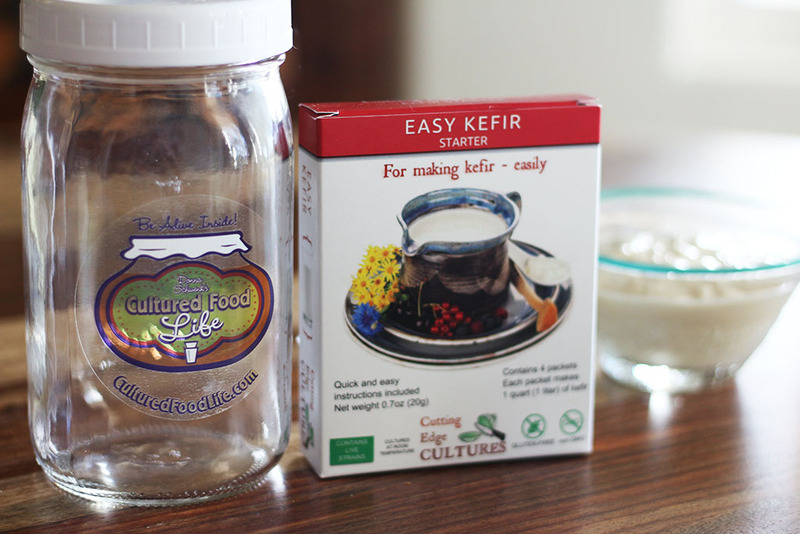 I brought my kefir grains and a scoby on vacation with me. I have a kitchen in my condo and have the trilogy culturing here. 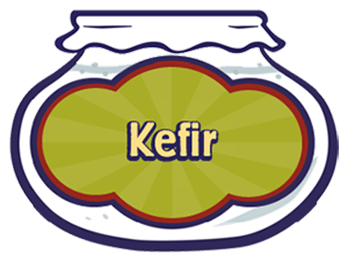 Have shared the kefir grains with 3 sets of new friends. I second fermented my kombucha w/papaya, pineapple, kiwi, mango and ginger.I made my second batch of fermented veggies today, it contains bokchoy, carrot, Dicon radish, spinach, jicama, beet, ginger, garlic, fresh grated turmeric, garlic, onion, cayenne pepper, Bragg seasoning, sea salt and kefir whey…experimenting! Everything seems to like the upper 70’s to mid 80° temperature, including me! No stomach problems this year with the good bacteria working their magic! 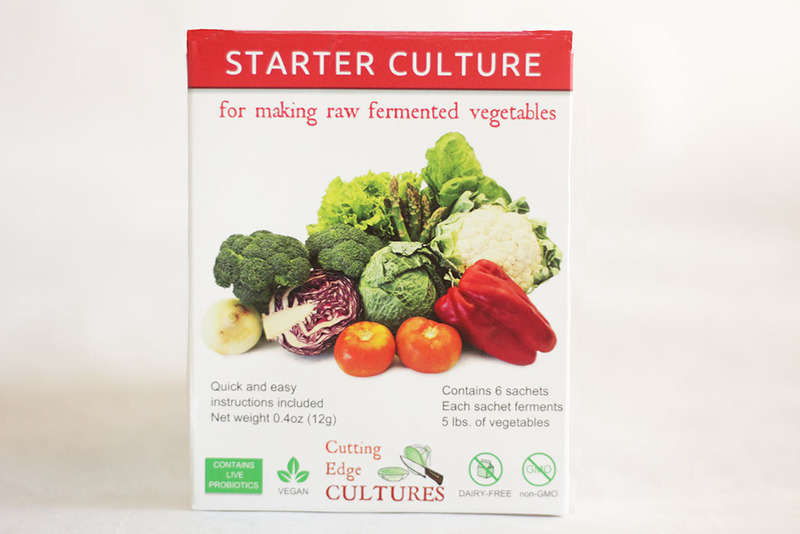 A lot of the foods they are taking about are fermented foods made with vinegars and not the way these are made. These foods help greatly with killing harmful yeasts and bring balance back to the body and really made a huge difference for so many. I have many those issues as well. I had a question, you mention that these are good for us because vinegar is not used. Does this include acv? 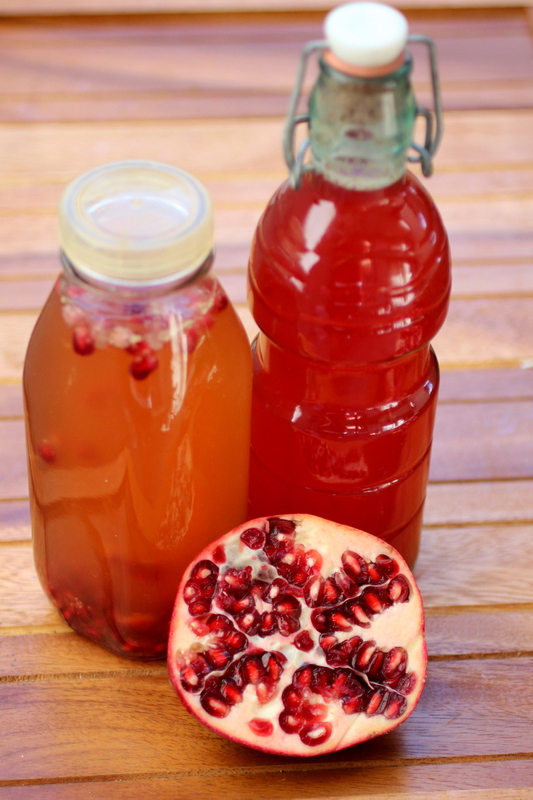 I was under the impression that acv was good and also kills off yeast and candida! It is good if it is not pasteurized but most vinegars are not but the ones that have the mother in them are great! 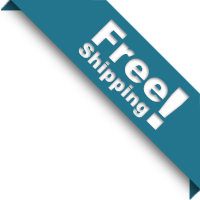 Love this site!! I have learned so much and have gained a true appreciation for these bacteria and all they do. One of the things that I have not found on your site is any reference to things that we do or eat that harm these bacteria. Are there things we should avoid to protect them?? By the way, you need to create a Lifetime Membership 🙂 I can’t imagine being without all this fantastic information. I’ve learned so much from you, thank you. I took a class on vegetable fermentation and I knew more than the educator did because I had been studying your website. I’m taking Acidophilus from Trader Joe’s but I don’t feel different. Is it true you have to eat prebiotics in order to feed the probiotics? (I think I heard that some prebiotics are fresh garlic, Bubbies Sauerkraut, and Natto from frozen section in Asian store). Any ideas if store bought kefir would help cure Athletes Foot? I hear that it’s almost impossible to cure (as is toe nail fungus). Thx! For Bev. with athletes foot, I cured it when the ball of my foot was covered and I used Tea Tree Oil, and have also used Oil of Oregano and Ozinated Olive Oil for some fungal diseases on foot. All applied topically. I did not know about fermented foods at this time. 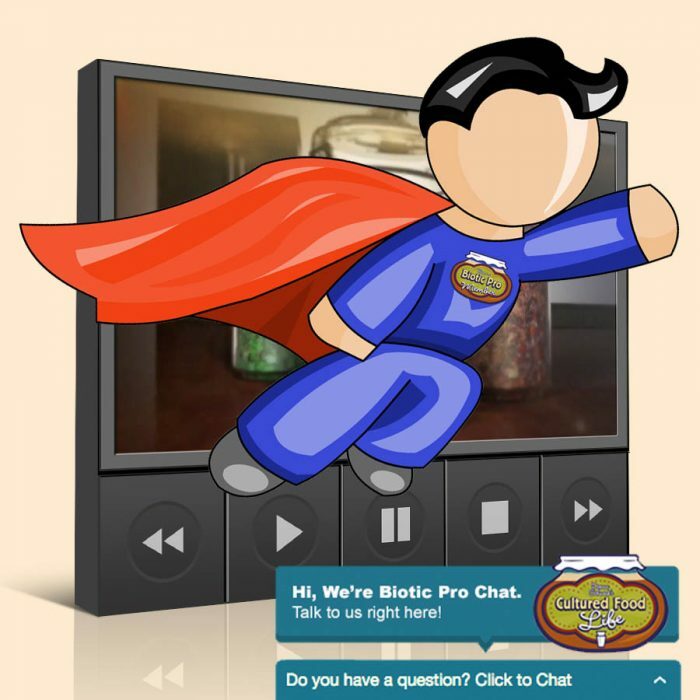 I appreciate all the recipes and good information on your site. I have shared it with friends. 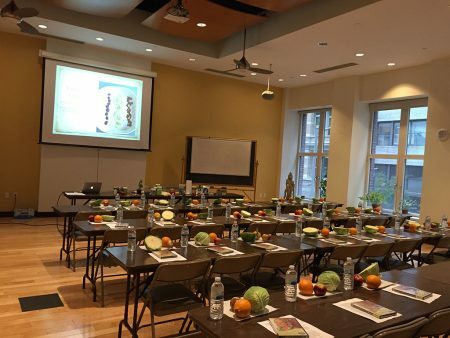 Thanks for your passionate encouragement to make and enjoy these health giving foods! 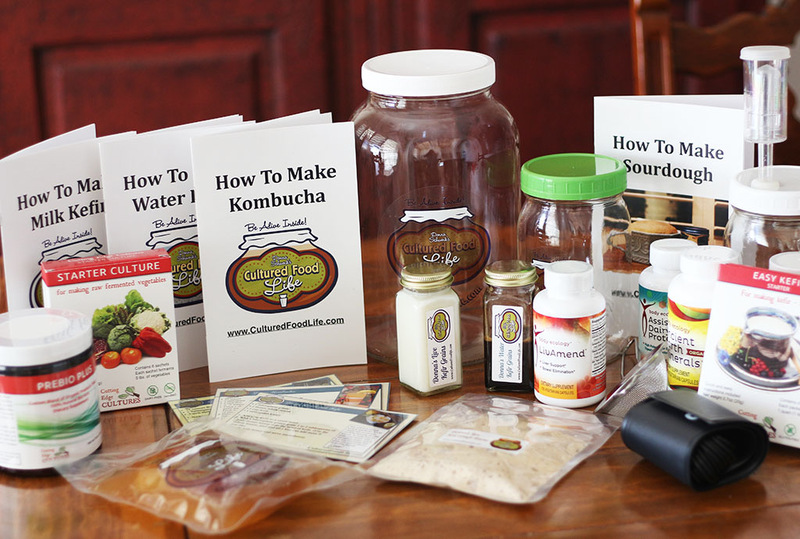 Cynthia, what is the protocol you are following for healing your gut and your thyroid issues? Thank you!